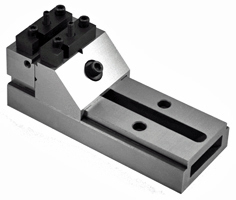 PRECISION VISES by Suburban Tool, Inc.
High precision, solid one-piece steel construction with body and jaws hardened to Rc 58-60. Angled center channel provides extra jaw capacity. 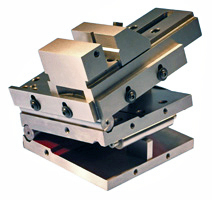 V-237 models have a ratchet mechanism with notched pockets and one-piece drawbar. 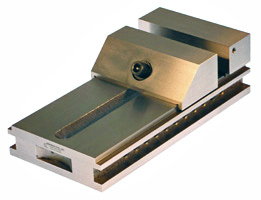 Jaw can be opened and closed without unbolting vise from work surface. End pockets for convenient clamping on V-237 models and larger. V-237 models and smaller have horizontal and vertical vees in the movable jaw. In addition, the "J" models have vees in the tops of the jaws and 1/8" x 1/8" steps at the top inside face of the jaws.